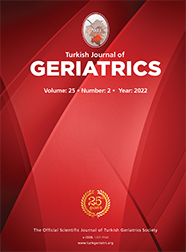 2Dokuz Eylül University, Faculty of Medicine, Anesthesiology and Reanimation, İZMİR Introduction: The sunken cheeks of edentulous elderly patients may cause mask ventilation to be ineffective or even impossible. The aim of this study was to identify the frequency and causes of difficult mask ventilation in geriatric patients. Materials and Method: This study was completed prospectively in 8 months, and included 264 patients that were ³65 years old, undergoing elective operations. Difficult mask ventilation form 1 (demographic data, mouth opening measurements, mallampati score, thyromental and sternomental distance, mandibular protrusion test, neck movement and circumference, the presence of beard in male patients and their dental situation) and difficult mask ventilation form 2 (their experience as a mask ventilation user, difficulty of mask ventilation, using the opioid/neuromuscular blocker agent in induction of anaesthesia and maintenance of the airway) were completed. Results: Surgical intervention was performed in 7948 (29%) patients aged 65 years and above. A total of 254 patients were included in the study. Patients were mean aged 72±6 and 58.7% male. Overall, 68.9% of patients had no teeth, whereas 31.1% had normal teeth/fixed prosthesis. 32.7% of patients had grade 1 difficult mask ventilation, 54.7% had grade 2 and 12.6% had grade 3 difficult mask ventilation. Grade 4 difficult mask ventilation was not observed. In male patients had beard 26.2% in grade 1, 46.3% in grade 2 and 66.7% had in grade 3 difficult mask ventilation.